don't think of superheroes. 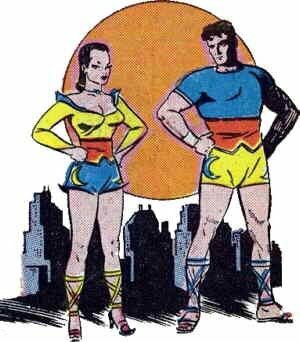 But in the 1940s, even that unlikely publisher was smitten with the superhero bug — not once, but twice. One of them, Firefly (who aside from being an insect was similar to The Human Torch) (and no relation, by the way) was a mere funny animal, but the other was as much a "real" superhero as The Black Canary, Wonder Woman or any other female character that put on a superhero outfit and went around bashing evil. In fact, Moon Girl had more in common with Wonder Woman than just that. Like Wondy, she was the princess of an exotic land and heir to that land's ancient tradition of powerful women. Like Wondy, her origin story involved a tournament in which she came out on top. And like Wondy, she was published by the legendary Maxwell C. Gaines, who, aside from founding EC, had spearheaded All-American Publications, the division of DC Comics where Wondy got her start; and before that, had more-or-less invented the modern comic book format itself. Gaines is sometimes credited with having created the character, which may explain the similarities to Wonder Woman; but it may also be that this is like publisher John Goldwater's claim to the creation of Archie — a person in authority glomming credit on the basis of having made a general suggestion that a writer and artist fleshed out. The writer, in this case, was probably Gardner Fox, whose credits also include The Flash, Ghost Rider and many others. The artist was definitely Sheldon Moldoff, who created or co-created The Black Pirate and Kid Eternity, and who had lengthy runs on both Hawkman and Batman (the latter as creator Bob Kane's ghost). The story opened in the remote kingdom of Samarkand, where the princess, identified only as "Princess of the Moon" or "The Moon Girl", learned of her legacy — a magic moonstone that made her invincible in battle (which she was already pretty close to being even without it), and an ancestral history of not being made happy by being able to defeat any suitor. This was complicated by the fact that, like the later Marvel Comics version of Red Sonja, she'd already made it clear she could never marry a man who wasn't better on the battlefield than herself. Sure enough, when Prince Mengu, from a nearby kingdom, came a-courting, she beat him up and sent him on his way, but was sorry about it afterward. She traveled the world looking for him, and finally tracked him down in America, where he was coaching student athletes under the name Lionel Manning. She adopted a pseudonym of her own, Clare Lune, and got a teaching job at the same school. Together, they went into the business of fighting crime while wearing tight, bright costumes. They quickly moved out of the back pages of other people's comics, and into one of their own. In fact, Moon Girl & the Prince #1, like the Houlihans appearance, was dated Fall, 1947. Mengu's role was almost immediately reduced, however, as with the second issue, his name was dropped from the title (and even in the first, he didn't appear as prominently on the cover as Moonie herself). Sheldon Moldoff continued to draw most of the stories, but others wrote the majority of them. With the seventh issue, the title was changed again, to Moon Girl Fights Crime, in an apparent attempt to cash in on the trend pioneered by Lev Gleason's highly successful title, Crime Does Not Pay. Also in that issue, Moon Girl was joined by a female sidekick called Star, further diminishing Prince Mengu's role. Romance #9 (October, 1949) contained one last Moon Girl story, "The Heart Pirate", written and drawn by editor Al Feldstein. But with a name like that, in a comic with the word "romance" in the title, it seems scarcely representative of the superhero genre. The series ran three more issues, but Moon Girl wasn't in them. In fact, she was never seen again. Today, she isn't remembered as a trend-setter, a prominent showcase for major talents, or anything else of great importance, but merely as an oddity — a standard, average superhero published by EC Comics. Text ©2003-07 Donald D. Markstein. Art © EC Comics.